Questions and Answers about Hoka Hey? Why are you limiting the number of riders in 2020? Will passengers be allowed in 2020? Will you be offering a monetary prize in 2020? Will tracking devices be used again this year? Will electronics be allowed for navigation in 2020? How will speeding violations be handled this year? 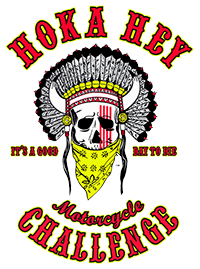 Is the Hoka Hey Motorcycle Challenge™ limited to Harley's only? Is the ride going through Mexico or Canada in 2020? Do I have to ride the entire route? Are you going to publish the route this time? Are support teams going to be allowed? Do riders have to camp near their bike? How will you know if any one cheated during the Challenge? Are we allowed to outfit our bikes with a larger aftermarket tank? Is a second fuel tank considered to be a fuel cell? Do I have to pay my entire entry fee at one time? Will it matter if I put one bike on the application and then decide to ride another? Do you have a comprehensive list of rules and how the event is run? Is there a specified route or do participants have routing flexibility? What types of roads will the route follow? Your ability to change the rules before the event doesn't seem acceptable. Will trikes or trailers be allowed? How many riders are you expecting to participate? Is there going to be a drug test for the winner? Will the bikes be quarantined before the Challenge? Will any of the organizers be participating? Can I have work done on my motorcycle at any of the Checkpoints? Is there an infraction that could result in being removed from the event after leaving the Starting Line? Will there be a Hoka Hey Challenge in 2019? 1- Why are you limiting the number of riders in 2020? There are a number of reasons why we decided to limit the number of riders for the next Challenge. Among these was the safety of our riders. The Challenge route will be one of the most a technical and challenging routes ever. This event is not intended to be for everyone and we believe that any one that takes on the Hoka Hey Motorcycle Challenge must be a cut above the rest. It was decided that we would limit the number of participants when we determined that it is our responsibility to ensure that any one who participates in this epic event is held to a higher standard. Any one that is new to the HHMC will have to submit a biography that describes their riding experience and their reasons for wanting to participate in what has been called the "Toughest Ride for the Toughest Riders on Earth!!!" 2 - Will passengers be allowed in 2020? Yes. To carry a passenger you will need to submit an additional $100 and the passenger will need to sign and submit the signature page from the Release & Waiver. Passengers are not permitted to help operate the motorcycle or trike if you intend to be eligible for placement as a certified finisher. 3 - Will you be offering a monetary prize in 2020? No. As a direct result of having a prize structure that recognized finishing placement, there had been a misconception that the Hoka Hey Motorcycle Challenge was a speed race and this opinion has taken the focus away from what the event was intended to be. The Hoka Hey Motorcycle Challenge was intended to not only test a rider’s stamina and endurance, but their mental capacity to follow directions and adapt to any situation. In fact, the exact length of the routes and the number of participants are withheld for the sole purpose of keeping the riders guessing. Additionally, any rider who arrives at the finish line prior to 10 days after the start of the event will be disqualified from any awards. All riders that arrive at the finish line within the allotted time, having followed the prescribed route and the other Terms and Conditions of the Event as determined by third party validation and observation along the route will be recognized as Challenge Finishers. All riders who participate may be eligible to receive one of 4 awards. Which will be awarded to the 4 riders that exhibit the spirit of Hoka Hey throughout the event. All participants are encouraged to share stories of their experience during the event and to nominate potential award recipients. A word of caution though... Riders shouldn't be lulled into a false sense of security by the format of the event. Challengers will still have to rely on their endurance, navigation skills and wit to reach the finish line in time. 4 - Will tracking devices be used again this year? Yes. We will be working with US Fleet Tracking™ again this year. The cost of your tracking device is the participants' responsibility to pay but we have negotiated on your behalf to get you the best possible price. 5 - Will electronics be allowed for navigation in 2020? No. Electronic devices to include; GPS, iPads, Smart Phones, track & call, Bluetooth and other communication devices used as navigation aids will be discouraged again this year. The use of mounted/hardwired GPS and/or in-helmet communications is also restricted and shall not be powered up for use during the event. 6 - How will speeding violations be handled this year? In order to be eligible to receive an award, riders must arrive at the finish line, having followed the rules established in the Terms and Conditions of the Event and item #2 under Rules of Engagement stipulates that: Participants must NOT speed. Any moving violation for speeding (ANY speed, NO exceptions, regardless of the fact that YOU may only have been trying to pass a slower moving vehicle), failure to signal, improper lane change, etc. will be grounds for automatic disqualification from eligibility to receive awards. Challengers may continue to participate in the Event however they will no longer be eligible to receive recognition or awards. Organizers reserve the right to monitor and review riders' tracking for speeds and route infractions and contenders will have to certify that they did not receive a ticket for a moving violation during the course of the event. Contenders need not be present at the End of the Road party on the 22th of August 2020 in order to receive an award. 7 - Is the Hoka Hey Motorcycle Challenge™ limited to Harley's only? No, the event will be open to all American Manufacturers of V-Twin, motorcycles like Harley-Davidson®, Victory, Indian® and custom motorcycles. 8 - Is the ride going through Mexico or Canada in 2020? No, the 2020 ride will remain entirely within the 48 Contiguous United States. 9 - I would love to participate but don’t think I can take that much time off work. Do I have to ride the entire route? Riding the entire route should be the intent of each applicant. In the past we have allowed people to ride a portion of the route but since we have restricted the number of riders for each event we feel we would be doing a disservice to others allowing a rider's slot to be taken by a rider who does not intend to ride the entire route. Yes, your intent should be to ride the entire route. 10 - Are you going to publish the route this time? No. We won't be providing much in the way of additional information about the route again this year but, participants should expect to encounter vast technical riding and will have to rely on their navigation skills and wit to reach the finish line in time! Riders will need to reach the checkpoints in order to receive their driving directions for the next leg of the journey. 11 - Are support teams going to be allowed? No, family and friends may meet you at a checkpoint to provide moral support. However - they may not follow you across the continent and they may not provide mechanical or navigation assistance, aid or support of any kind. 12 - Do riders have to camp near their bike? In order to receive an award participants should plan to use a tent, lean-to or a hammock during the Hoka Hey Motorcycle Challenge™. Challengers with physical disabilities are automatically exempted from this restriction. 13 - How will you know if any one cheated during the Challenge? There will be a thorough cross verification of the riders' vapor trails from their tracking devices. There will also be representatives ("Marshals") from the organization out on the road who will be randomly tracking, following and observing the riders during the event. These observers may be in unmarked vehicles and may choose to remain anonymous throughout the Challenge. Or, they may be set up in a pop-up checkpoint anywhere along the route. Their word alone, will be enough to disqualify riders from further participation if serious infractions are observed and reported to the Event Organizers. Event Organizers also reserve the right to implement a random drug screening to discourage the use of performance enhancing drugs during the event. 14 - Are we allowed to outfit our bikes with a larger aftermarket tank? Yes, as long as it does not exceed the 6.2 gallon total limit. No fuel cells or gas cans will be permitted though. 15 - Is a second fuel tank considered to be a fuel cell? For the purposes of the Hoka Hey Motorcycle Challenge™ a second fuel tank would be considered a fuel cell and would disqualify that bike from participating in the event. 16 - Do I have to pay my entire entry fee at one time? No, you can hold your space in the Hoka Hey Motorcycle Challenge™ with a $250 deposit that will be applied to the $500 entry fee. The remainder of the entry fee must be paid not later than 9 May 2020. If you have applied a deposit but cannot pay the remaining amount by 9 May 2020 it is imperative you contact Hoka Hey Organizers and explain your intent; we will do all we can to work with you. You can make your full payment, deposit, or pay the remainder of the entry fee at our Secure Online Payment Center. 17 - Will it matter if I put one bike on the application and then decide to ride another? What if my registered motorcycle is incapacitated just before or during the Challenge. We just need to have an idea of what to look for on the day of departure. So - if you change your mind after submitting your application - or if you will be renting a motorcycle for the Challenge - just give us a call or submit the change in writing. No problem! In the event your registered motorcycle is incapacitated just before or during the Challenge you can replace it by purchase of a new one, used one or use another that you already own. However, the replacement motorcycle will be subject to all restrictions and requirements in accordance with the Terms & Conditions. 18 - Do you have a comprehensive list of rules and how the event is run? Sure! You should be able to find everything you need in the Terms and Conditions. The T&C have been revised in order to address some of the concerns that came out of the previous Challenges so potential riders should read them over carefully before applying. 19 - Is there a specified route or do participants have routing flexibility? We will be picking the route and will provide Challengers with driving directions. In order to be considered eligible to receive an award, Challengers will be expected to stick to the route even if it means backtracking 100 miles to find a missed turn. There will be established checkpoints and the possibility of a random checkpoint and riders are expected to hit them all if they want to be in contention for the prizes. 20 - What types of roads will the route follow? For the most part, the route will follow secondary paved roads. It is the Organizers intent to not use interstate highways, but sometimes this cannot be avoided; if used they will be minimal. It is also the intent of the Organizers to not use unpaved roads or byways; again, sometimes this cannot be avoided but if used they will be minimal. The Organizers will have the 2020 Hoka Hey Challenge route pre-ridden by experienced riders before the route is printed. Sometimes pre-riding the route is difficult to accomplish so, if after the event starts, the lead riders discover a particular stretch of the route is dangerous they are expected to contact the Organizers and, if possible, an alternate route will be disseminated to all follow-on riders resulting in a change of the route during the event. 21 - Your ability to change the rules before the event doesn't seem acceptable. This comment must be referring to the Force Majure or the section of the Terms and Conditions entitled "Rules Subject to Change." These sections are fairly specific in their reference to matters that are completely beyond our control (fire, earthquake, epidemic diseases, etc.) and provide us with the ability to adjust to unforeseen circumstances. However, the Organizers have no intention of making changes after the Rider’s Meeting which will be held the night before take off. 22 - Will trikes or trailers be allowed? Yes, trikes, trailers and/or sidecars will be permitted on a case-by-case basis. Please provide your reasons for needing to ride a trike or use a sidecar or trailer when completing your brief biography. 23 - How many riders are you expecting to participate? Our mission is to promote awareness of the plight of many of our nation’s people who have lost hope. These people can be found at every turn such as Native American Reservations, inner cities, the Appalachian Mountains and even rural areas that have all been beaten down by either the economy, family issues, drug & alcohol abuse, medical issues or a combination thereof. We are looking for great riders; not great numbers. For this reason, we have decided to limit the number of participants to 100 in all future Challenges. This allows the organizers to provide riders with a safe and well organized event that is intended to change lives. 24 - Is there going to be a drug test for the winner? Possibly, the Event Organizers reserve the right to implement drug screening on a random basis to discourage the use of amphetamines or methamphetamines during the Challenge. 25 - Will the bikes be quarantined before the Challenge? No, we will be inspecting the bikes when you arrive for registration but will not sequester them at any time. 26 - Will any of the organizers be participating? Certainly! After all that is why we've organized the Challenge in the first place. We love to ride and look forward to an opportunity to test our own abilities! The catch to this is that the organizers cannot win any award associated with the Event. We may come in first, or do something great but someone else will ride away with the award! 27 - Can I have work done on my motorcycle at any of the Checkpoints? Certainly! Any repairs needed can be conducted at any of the Checkpoints. Checkpoints have agreed to have technicians on duty for a specific amount of time during the Challenge to accommodate your needs. However, it is highly recommended you contact the Checkpoint prior to arrival and inform them of the type and possible extend of the work that needs to be done on your motorcycle; even if it is only a normal service. It is even more important you contact the Checkpoint if you need major repair. Normally an on duty technician will be able to accomplish a normal service but a major repair may require a different technician be on duty. If the Checkpoint is unaware of a needed major repair upon your arrival it may be required that you wait until the start of the next normal business day to have your repair completed. Advance notice is HIGHLY RECOMMENDED. Having work done on your motorcycle (emergency repair or otherwise) at a dealership other than a Checkpoint will not disqualify the rider. 28 - Is there an infraction that could result in being removed from the event after leaving the Starting Line? Yes! Any rider who consistently disregards the speed limit by more than 20MPH may result in that rider being asked to leave the event. Riding erratically or reckless may result in that rider being asked to leave the event. Any consumption of alcohol or the use of illegal drugs will result in being asked to leave the event. The Hoka Hey Motorcycle Challenge is sanctioned by the American Motorcycle Association (AMA) and it is incumbent upon the Organizers of Hoka Hey to abide by a set of standards of which there can be a zero tolerance. Suffice it to say, any action that endangers fellow riders or others on the highway may result in being asked to leave the event. Be sure to read the Terms and Conditions. 29 - Will there be a Hoka Hey Challenge in 2019? No. However, there is an event being planned to allow Challengers and Supporters to join together and celebrate what has happened during the past year. Sign up for our newsletter and watch the website for more information. In fact, you can expect this pattern to continue; a Challenge every two years and during the off years, a special gathering at a preselected site.